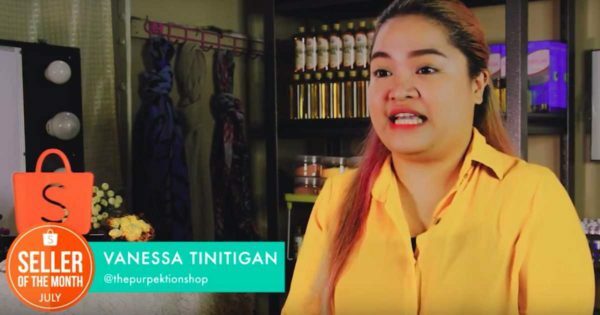 Vanessa Tinitigan’s The Purpektion Shop is among the top online shops on the platform Shopee and is making around P100,000 to P300,000 monthly from selling organic but affordable skincare products. But before achieving this kind of success, Tinitigan’s business literally overcame a huge storm. The young entrepreneur’s bazaar business in Alabang was among those ravaged by typhoon Yolanda, one of the strongest recorded typhoons to ever hit the country back in 2013. Despite losing almost everything and even giving up business for a few years, the young businesswoman was able to recover and is even earning so much more now through online business. “Nabagyo po kasi kami sa area namin sa Cavite. May bazaar ako noon or tiangge sa Alabang. Tapos outside po kasi siya so tent lang. Dahil sa lakas ng ulan at hangin, ‘yong mga paninda ko noon, tinatamaan ng ulan. Tumatapon ‘yong paninda dahil sa lakas ng hangin. Pinasok po ‘yong bahay namin ng baha. Nandoon po sa baba ‘yong items ko, di ko na po siya nasalba,” Tinitigan said during her interview with My Puhunan. Because she lost almost all of her products as well as the trust of her clients, Tinitigan closed her business and decided to go abroad to start anew. After experiencing yet another failure in her new venture, Tinitigan returned to the Philippines with nothing but determination to be successful once again. She decided to give entrepreneurship one more try by selling the products she was able to save from the typhoon. This time, she showcased her products on Shopee, a popular online shopping site. To her surprise, customers began buying her products in less than 24 hours from posting. Within a month, she was able to earn around P20,000 to P50,000 making her the “Shopee Seller of the Month”. Indeed, her business has come back from the dead. In order to make her business grow further, Tinitigan utilized her experience in the skin care industry abroad. Eventually, she was able to launch her own skin care brand. Tinitigan hopes that her story would inspire aspiring entrepreneurs particularly millennials to face their fears when it comes to doing business. “Normal lang pong matakot. Hindi ka po nangangarap nang malaki kung di ka po natatakot. Ang sa ‘kin po, sipag lang po talaga at saka tiyaga. Kasi po ako nag-start po ako nang walang puhunan, kung di ‘yong sipag at tiyaga lang po. Eventually po, everything will fall into place,” Tinitigan said. Watch her inspiring story below.